Makai has designed a variety of deep water (2,000′ and greater) ocean pipelines ranging from 12" diameter to 48" diameter. For each of these pipelines, Makai has developed the deployment methodology and plan as an integral part of the design. For four of these pipeline projects, Makai has provided on-site deployment engineering support and guidance to the contractor. Makai designed, wrote the deployment plan, and provided engineering assistance for the installation of this unique mooring in 3,000′ of water. 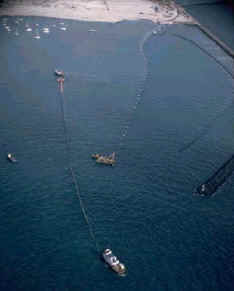 The mooring for the OTEC barge was the 24" cold water pipeline, attached to a large gravity anchor on a 23 degree slope. Makai designed, wrote the deployment plan and assisted in the training of Hawaiian Dredging and Construction personnel for this NOAA/DOE sponsored project. 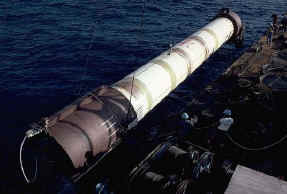 The deployment demonstrated the ability to install large diameter (8′) pipelines on steep, rough terrain without divers. Makai personnel served as project engineers, technicians and advisor’s during the deployment at Keahole Point. Makai designed and wrote the at-sea operation plan for installation of a two-point mooring in 1,300′ of water for an 8′ x 400′ long suspended test pipeline for Hawaiian Dredging and Construction. In addition, Makai developed the deployment plan for the installation and recovery of this large pipe.